Colorful blooms open when the sun shines bright! The stems of succulent-like foliage may be upright or spreading and the blooms single or double, depending on variety. 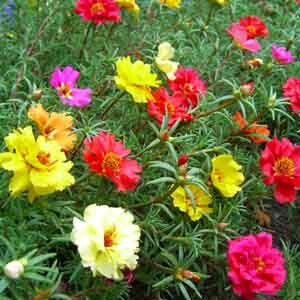 Carefree color for poor soil and hot, dry situations. Tolerates poor soil, heat, and drought. Prefers light, sandy soil. Allow soil to dry between thorough waterings. Trim back as needed to keep neat and compact.